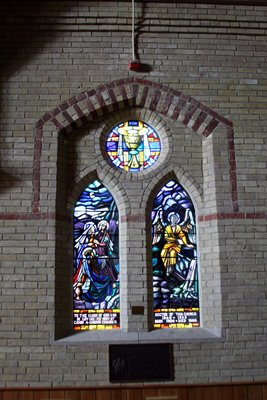 A colour photograph of stained glass windows in All Saints' Anglican Church. All Saints' Anglican Church was built in 1865-66 at the north-west corner of Dundas and Centre Streets. In 1870 the spire was added. The church features many beautiful stained glass windows including one Hamar Greenwood, 1st Viscount Greenwood, arranged in memorial to his parents. Elmina Lynde donated the brass pulpit. The church was gutted by fire on December 14, 2009, and was restored by 2011. All Saints' Anglican Church Stained Glass Windows, September 10, 2013, Sarah Ferencz. Whitby Archives D2013_006_027.